Who purchases these dog house plans? 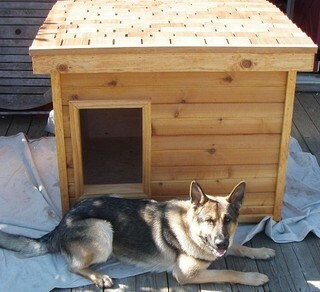 Law enforcement officers and law enforcement agencies worldwide purchase these dog house plans. Veterinarians, trainers, dog breeders, shelters, animal security agencies, schools for woodworking projects, and caring pet owners are among the list of satisfied customers who have purchased our dog house plans. What size dog house plans do I order? 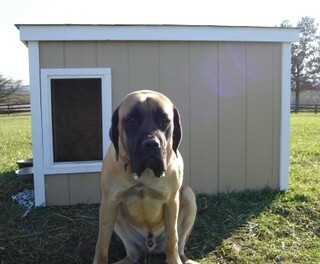 It is very important that you have the proper sized dog house for your dog. To accomplish this, you have to measure your dog. You take the measurement from the ground to the top of the front shoulder when the dog is standing. If your dog is puppy you can see the different kinds of dogs listed with each set of dog house plans. You can order the dog house plans that are designed for that type of dog. 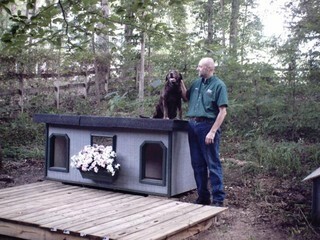 Feel free to email, so that we can help you choose the right size dog house plans. What model of dog house plans do I order? The model of dog house plans that you choose would be a personal preference depending on your pets needs. The 1 dog/1 door house plans are for 1 dog and has one door. 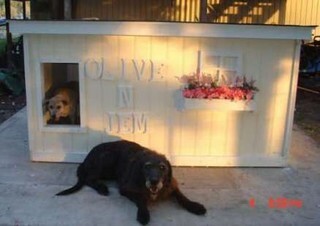 The 2 dog/1 door house plans are designed primarily for two dogs that love to be together. These dog house plans allow your dogs to sleep together in one sleeping area. If your dogs do not get along, then the 2 dog/2 door plans are the plans for you. 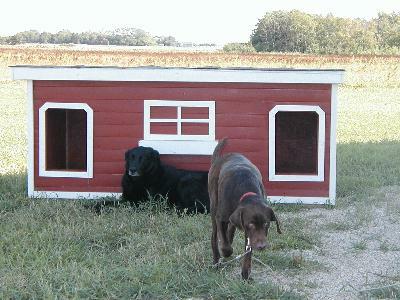 The 2 dog/2 door dog house plans are the most versatile plans available. These dog house plans have two removable wind walls and one removable centre partition wall. This means that all walls can be removed if so desired for your dogs to be able to be together, or separated completely with each have their own space if they don't get along. These dog house plans are used primarily by owners whose dogs have disputes or don't want to share their sleeping quarters. In some cases the disputes are not constant, so with these dog house plans the centre wall can either be put in or left out as the need arises. 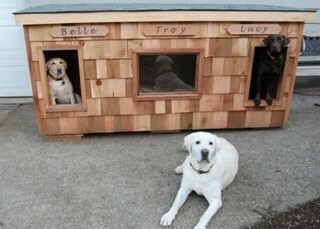 The 3 dog/1 door dog house plans are designed for three dogs that get along. With these dog house plans all three dogs have one sleeping area behind the removable wind wall in the cold weather, or the entire house when the weather is warmer and the wind wall is removed. These dog house plans make for a very large dog house. What tools are required to build these dog houses? There are no special tools required to build any of these dog houses. If you plan to build one of our houses the only tools required are: a hammer, square, handsaw, or a skill saw, drill, and jigsaw. What type of wood can be used to build these dog houses? The dog houses that we build here are built out of spruce plywood for the regular dog house and tongue and groove pine for the deluxe dog house. Both these materials can be substituted for whatever material is available in your area. The material list is made up by not having any seams in the plywood on the inside or the outside of the house. When tongue and groove pine is used it is only used on the outside of the house for a decorative look. Is the dog house sitting on the ground? No. 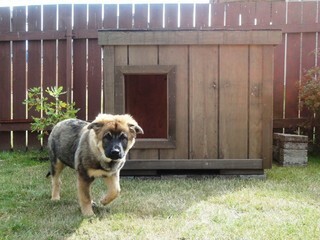 The dog house is designed so it is sitting up off the ground. This way the air can flow underneath the dog house, and it will not create moisture on the bottom of the house. The plans will show this in detail. Is the dog house insulated? Yes. The dog houses are fully insulated on the walls, floor, and roof. This will help maintain a comfortable temperature in all weather conditions. We do have Law Enforcement Officers in the Northern part of Canada that have been using these dog houses for a number of years, where the temperatures frequently go down to -40 deg. In such extreme cases, they do put a doggie door, piece of canvas or carpet hanging down over the door opening of the dog house. They do not use additional heat sources in the house. What is used for bedding inside the dog houses? We recommend using cedar shavings for bedding inside the dog house. The dog house is designed so that in the winter, when you have the wind wall in, the cedar shavings stay just in the area where the dog sleeps. Depending on which dog house plan is used, you will be able to put 4" to 6" of shavings on the floor of the house for the dog. When the wind wall is removed, the shavings can go in the whole area of the dog house and will be contained in the dog house by the way the door opening is designed. Do I stain or paint the dog house when completed? When we use plywood on the outside we paint the dog house. When we use tongue and groove pine we stain or varathane the dog house. 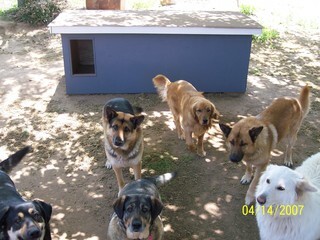 We do not use any paint or stain of any kind on the inside of the dog house. Why is this style of roof used on the dog house? The roof is slanted so that rain and water can run off. This also allows the dog to be able to jump up unto the roof of the house and lay down. Don't be fooled by other plans that have a peaked or barn style roof. These types of roofs on dog houses are ideal places for wasps, hornets and other types of insects or animals to congregate and build nests. It is also a tremendous heat loss for the house. 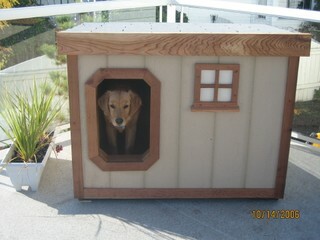 This is why our dog house plans are tested and proven successful. What is an optional outside kennel attachment? The plans include the instructions for an optional outside kennel attachment in each set of dog house plans. 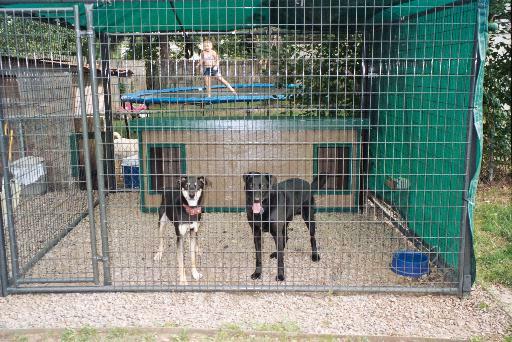 The outside kennel attachment is designed to be able to attach the dog house to the outside of a kennel, which will allow more room for the dog on the inside of the kennel. This is detailed in the instructions of the plans that you order. Are the dog houses easy to clean? These dog houses are designed with the handler or owner in mind. The roof of the house is on hinges for easy access to the inside of the dog house. All wind walls and inside partition walls are designed to slide in and out of the house for quick easy removable to be able to clean the dog house. This is all explained the in the detailed dog house plans. Can the completed dog houses be shipped? 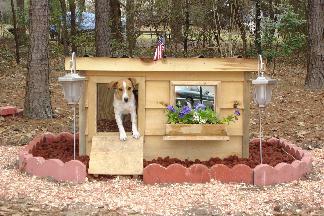 Due to the extreme cost of shipping, it is not feasible to ship the completed dog houses. You would be by far cheaper off to build the dog house yourself using our easy to follow dog house plans, or purchase the dog house plans and have a friend, or a local contractor or carpenter build the dog house for you. 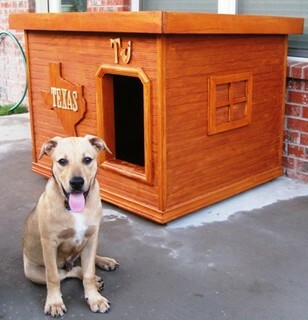 These dog house plans have been used by many first time builders with great success. The dog house plans are very detailed and easy to follow. Can these dog houses be purchased and shipped in sections? No. These dog houses are not designed to be built in sections. Can these plans be used for other animals? If you do not find the set of dog house plans that you require to meet your needs, feel free to email us with your special requests. We have custom plans already drawn up for special circumstances. 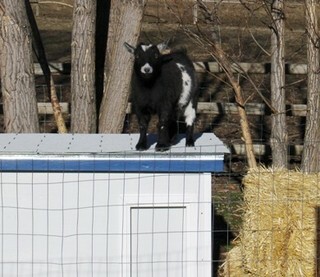 Examples of such plans are: plans for cats, plans for goats, as well as plans for pot bellied pigs, or plans that are used for well enclosures. All of these plans are designed using the same principals that are used in the K-9 Law Enforcement Dog House Plans. What is the cost of the Law Enforcement Dog House Plans? The cost of each set of Law Enforcement Dog House Plans is $29.99 U.S. Funds. Each set of dog house plans consists of: the regular version, the deluxe version, the material list, step by step instructions, the actual drawings (plans), and the instructions for an outside kennel attachment. How are these dog house plans sent? If you make payment for these dog house plans by using the secure server at paypal, and clicking on the "BUY NOW" button, you will be immediately directed to the download page after payment is made, and you will be able to download the dog house plans that you ordered. We always send out a confirming email to make sure you were able to download the dog house plans successfully. We can also email or send out the dog house plans via regular mail as soon as payment is received. The downloaded dog house plans version, emailed dog house plans version, and the hard copy mailed dog house plans version are all identical. All dog house plans are on 8-1/2" x 11" paper. How can payment be made for these dog house plans? 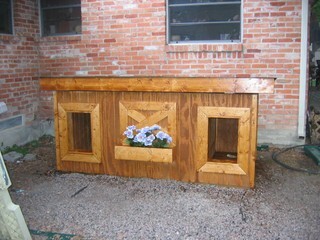 You can make payment for these dog house plans by credit card from the order form on our web site at: http://www.policedoghouses.com/dog_house_plans.cfm using the secure server at paypal with visa, or mastercard. Paypal will email you a receipt immediately when you have made payment for your dog house plans and will also notify us when your payment for the dog house plans has been received. At this time we send out a confirming email to you, to make sure that you were able to download the dog house plans successfully. Or you can send a Money Order or Certified Check payable to: Larry Ash for $29.99 U.S. Funds, along with your mailing address.